4 Is All This Really Necessary? Gameloft has carved out a nice little niche for itself by taking popular console games, and tweaking the formula (and title) just enough to get away with it. 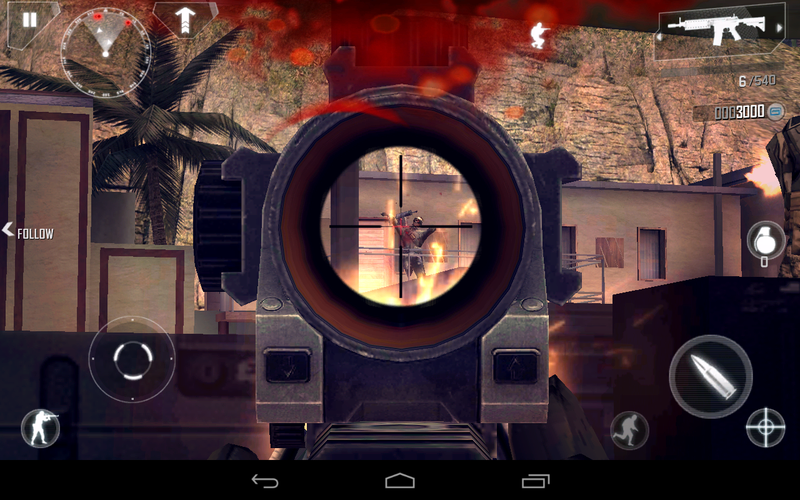 The Modern Combat series has been presented as the mobile equivalent of Modern Warfare, and it's just reached its 4th incarnation with Modern Combat 4: Zero Hour. 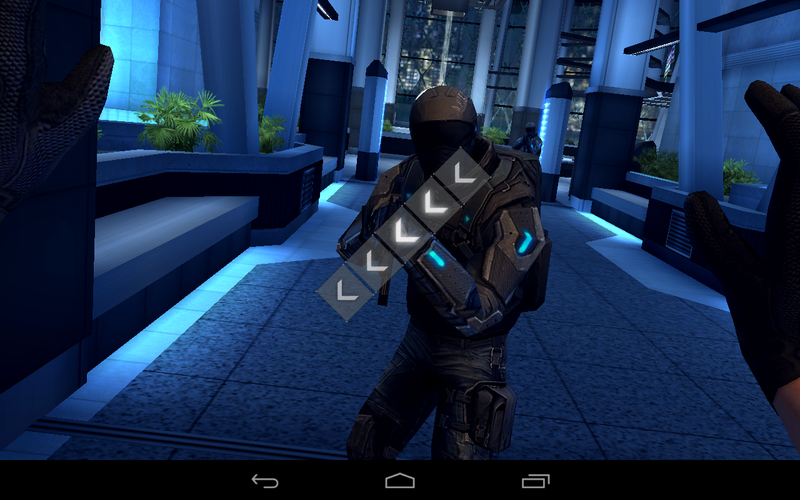 Does this formula of console-style play still work on Android? 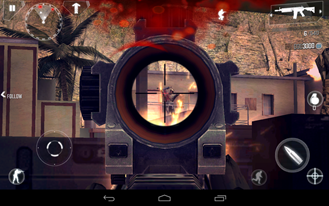 Modern Combat 4 is a first person shooter that makes heavy use of cinematic elements to tell what we can only hope is a good story. The game is split up into missions with a few auto-saving checkpoints along the way. 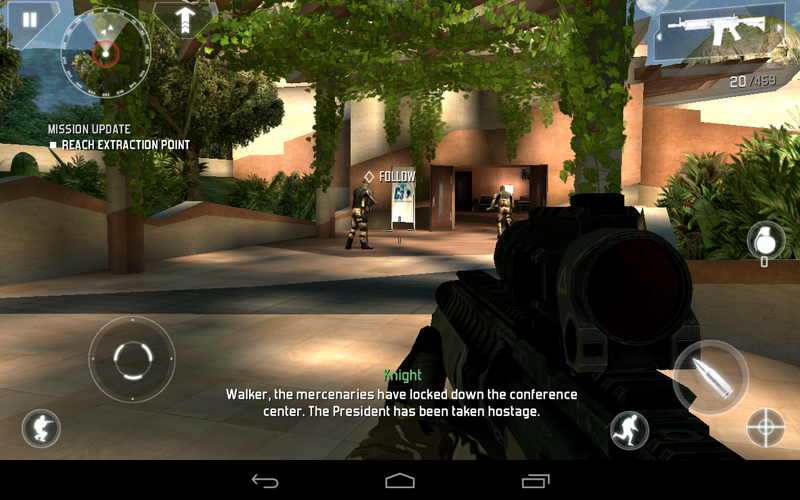 MC4 gives you waypoint markers to follow, which I'm happy to see. The actual shooting part of this title is great. There's plenty of action and the weapon selection is good. You have to learn to take cover, flank, and watch where your squad mates are. Some missions you play as the "good guys" and some have you take on the role of the villain, one Edward Page. This piqued my interest, but I'm feeling a little less enthusiastic having met Page. The problem I have with Page is just the most prominent example of a wide ranging issue with Modern Combat 4 – it talks too much. Heavy dialog in a game can be good, as long as it's well-written. I could do without a lot of the voice acting in Modern Combat 4, though. Your squad mates seem to shout the same four phrases over and over. Let's get back to Page for a second. 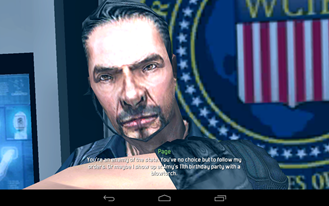 I understand that he's the bad guy, Gameloft. I do not – I repeat – not need a ten minute monolog from Page over the course of a mission regarding how much he loves killing Americans. Listening to this character pontificate, threaten, and curse got old really fast. He sounds like a more pompous version of Duke Nukem (if you can imagine such a thing). The concept of the rogue green beret turned terrorist is not a bad one, though a little predictable. It's the execution that needs work. There is also a multiplyer mode where you can face off against other players. Winning matches can add to your stockpile of in-game currency. Oh, did I mention there are in-app purchases? Yes, you can buy upgrades to make your character better in combat. These upgrades are not featured prominently, and I don't think you need to use them, but this is a $7 title, Gameloft. Why the upsell? 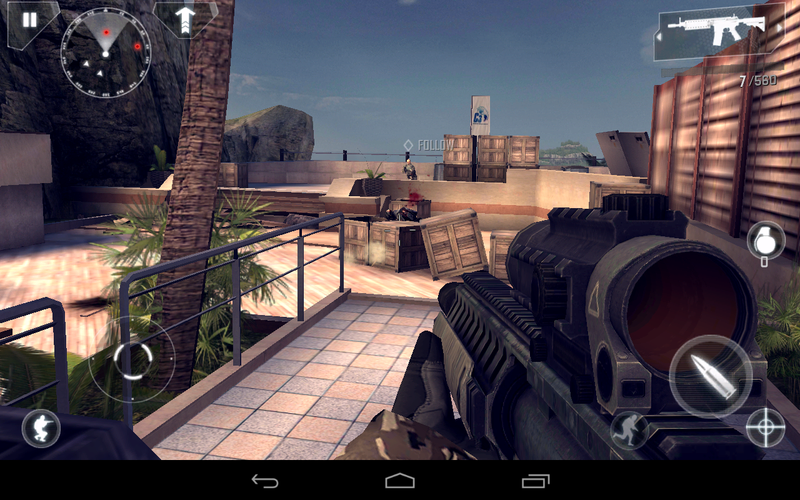 Gameloft sorted out how to make a first-person shooter work on a touchscreen a long time ago, and MC4 is still solid in that respect. Drag on the left side of the screen to get a virtual thumbstick that controls forward/backward walking, as well as side to side strafing. Use the right side of the screen to aim and look. This area is also where you'll find your buttons to fire, lob grenades, and use the scope. 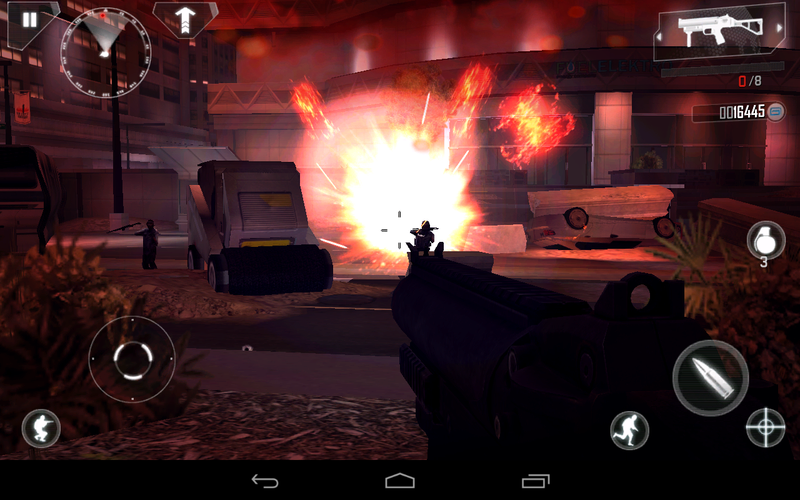 I like that you can hit the attack button and continue to drag your thumb around to sweep your field of fire. 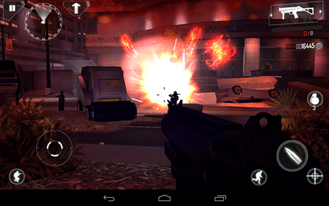 This makes it possible to take out multiple enemies rather than painstakingly target and shoot each one. 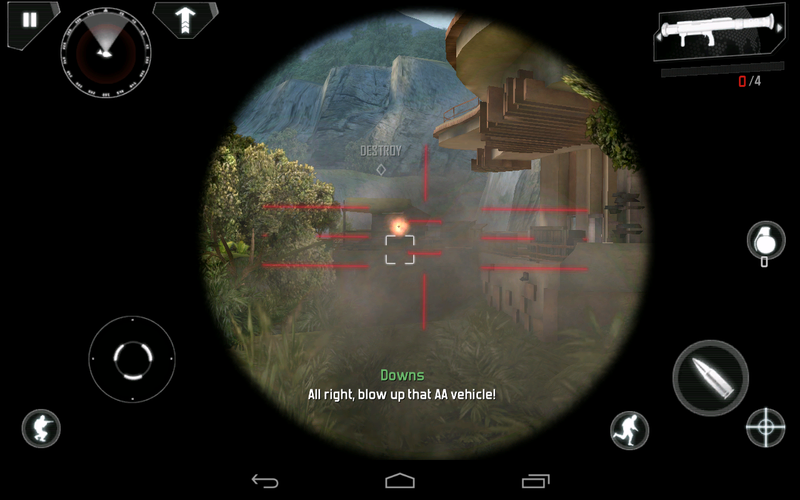 The game defaults to use aggressive auto aim, which is a little unsportsmanlike, but it's very hard to aim without it. 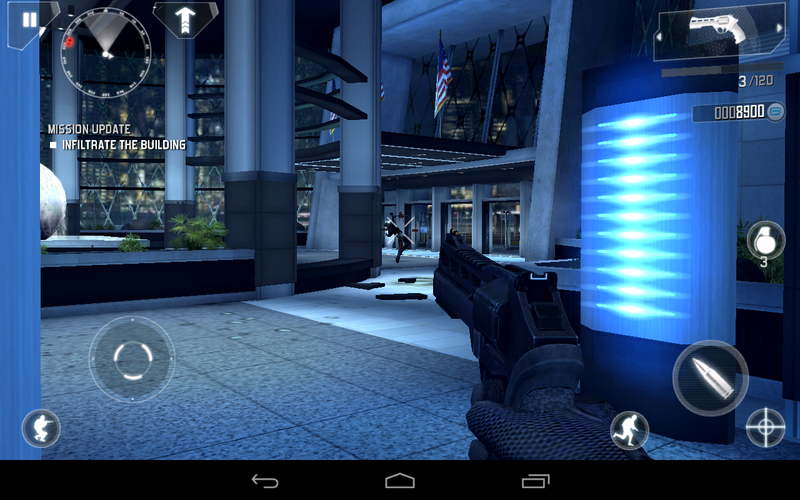 All these buttons work fairly well, with the exception of the grenade trigger. It feels like the hitbox is too large, causing me to waste grenades when I'm just trying to take aim. Modern Combat 4 also adds some touchscreen gestures to spice things up. You'll happen into a risky situation and a series of arrows tell you which way to swipe to get out of it. So for example, an enemy pops out from behind a box, you swipe down, and your character disarms the attacker and breaks his neck. Neat, right? The weird thing is that sometimes the game just doesn't register the swipe, meaning you have to reload and try again. Modern Combat 4 comes with a 1.9GB data download. 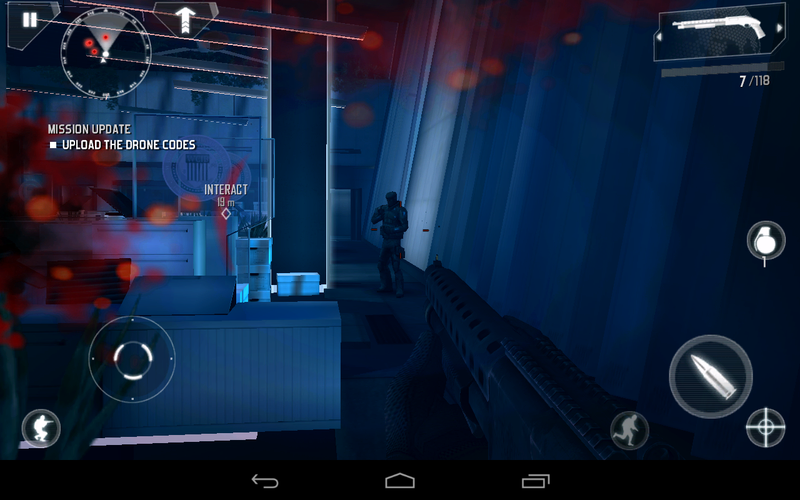 Gameloft has thankfully decided to use Google's data hosting service to serve up those bits. All that data gets you some awesome graphics. The environments are huge and open. You can take different paths to the goal, and it's plain to see that a lot of work went into the details. Texture resolution is great in most places. There were some surfaces that seem a little blurry up close, but that's the exception rather than the rule. The lines are clean with virtually no aliasing to speak of. There is definitely a robust game engine running behind the scenes, but performance was very good overall. 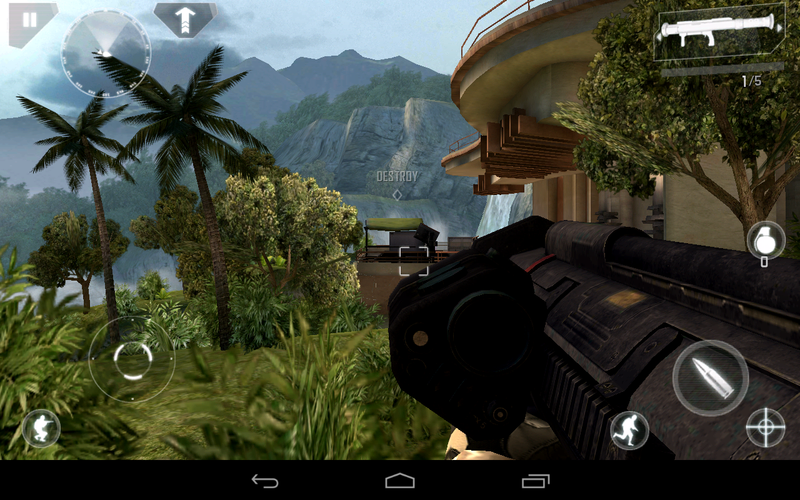 I played this on the Nexus 7 and only experienced a few random spots of lag. 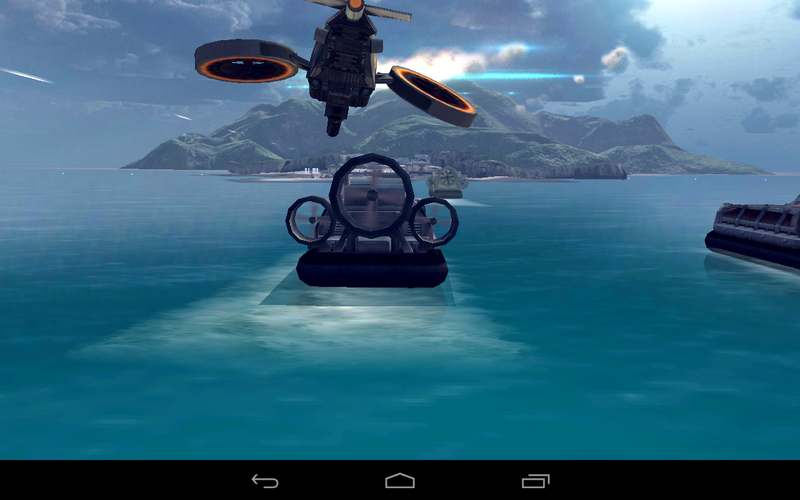 MC4 makes the mistake of not knowing the limits of its engine, though. 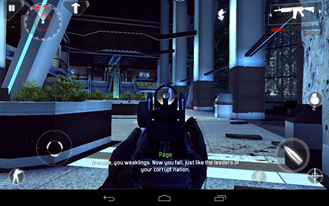 The cinematics with tight shots of character models show Gameloft has not achieved true console-quality graphics, despite its assertions to the contrary. The audio effects are realistic and immersive. However, as I mentioned above, the voice acting is overdone. The quality of the voices is fine, but I don't need my squad screaming at me to take out the hostiles every 5 seconds. I know what to do! Leave me be! 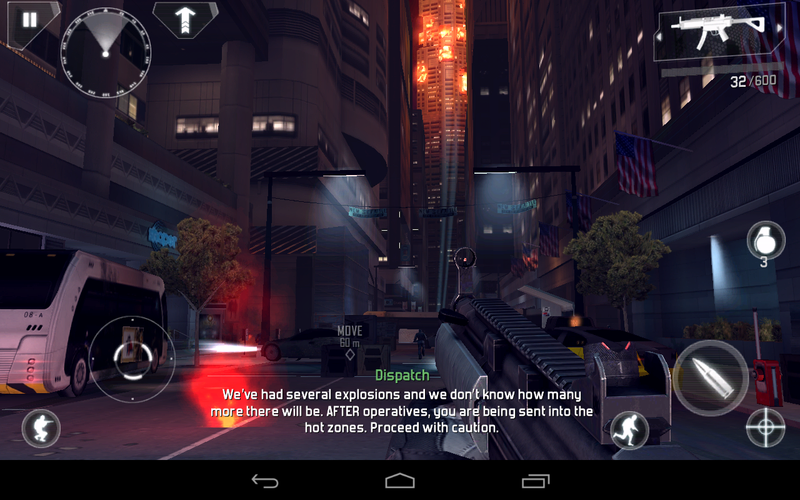 I don't want to give you the impression that Modern Combat 4 is a bad game – it's not. I think it's a very solid shooter. The controls work well, the graphics are great for the main run-and-gun portions of the experience, and you can tweak the difficulty to fit your level of interest. My only issue with the title is that it is a little too big for its boots, so to speak. 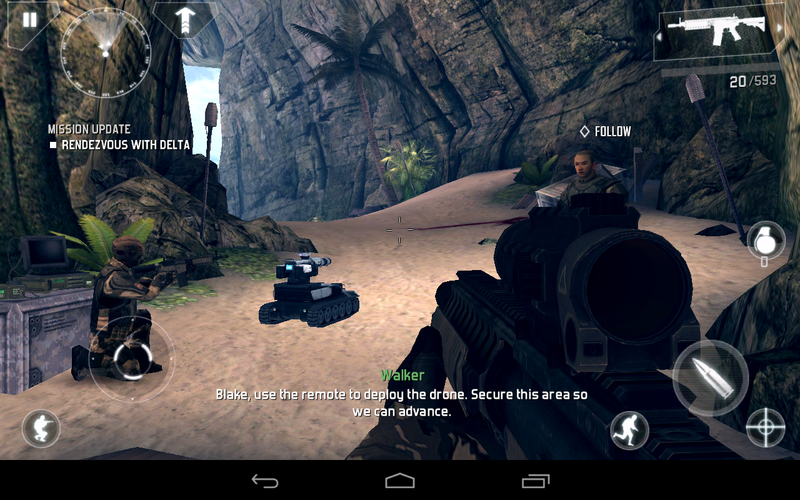 Modern Combat 4 is not a console game, but it wants desperately to be one. I just want to roll my eyes when it tries too hard with awkward cinematics, long monologs, and ham-handed writing. Should you drop $6.99 on this title? 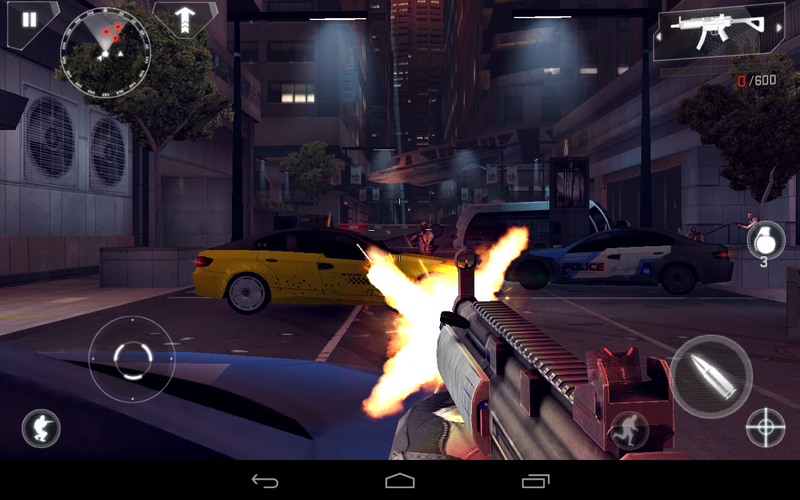 Sure, if you dig FPS games on touchscreens. It does that part of things right, but I think you could get away with skipping most of the cut scenes. The storytelling issues are not so bad that they distract from the good gameplay.